The visual CV platform arena is getting more competitive. After Vizualize.me generating CVs as infographics based on LinkedIn data, order two more platforms are currently offering the same features: CVgram.me and Zerply. CVgram imports data from LinkedIn and enables editing when to it comes to linking skills with particular jobs. Zerply, on the other hand, which positions itself as network whether user can connect, recommend or be recommended. focuses more on key elements of a cv – mainly experience, education and contact including social media presences. The platforms both provide sharing buttons, but similar their predecessor they do not provide any embedding codes making it difficult to have them freely shared. What’s new in comparison to Visualize.me is that Twitter and Facebook logins are now available with data imports suggested from either LinkedIn or Facebook. While an interesting move, this bring to me more questions about the use of Facebook for professional purposed and raises concerns about the constantly blurring line between private and professional. It’s been a couple of months since Vizualize.me announced its intentions to turn dry CVs into colorful, eye-catching infographics and launched its initial Twitter call to those curious to test their platform. Recently the Canadian based group made public its newest feature: LinkedIn integration. With several visualizations to choose from and with an option to edit all the fields within a CV, Vizualize.me keeps their promise…and does it well. While for an academic where emphasis is put on teaching, research or consultancy outputs (or all) this might not yet be the ideal form, I can certainly see the benefits of such vizualizations for graduates and for those aiming to enter/change to the field of interactive/social media. The experience and education fields are clearly separated but allow one to compare and observe the overlaps. (Perhaps, as a future option these two could be displayed on the vertical and on half, parallel screens rather than on the horizontal but I leave that to their designers). Skills and interests are also intelligently represented but I think the most value would come from integrating recommendations and languages into the picture in such a straightforward way that enables endorsements to stand out and projects the holder of the CV on the world map via his/her knowledge of foreign languages. I am unsure whether this is a partnership between LinkedIn and Vizualize.me but I assume that some agreement was reached that enables the Toronto-based group to access the professional networking site data. Regardless of the deal, for those aiming to enter the job market as well as for those looking for a change at a time when competition is so stiff having a CV that stands out is crucial. Of course, this will be a USP as long as only few will be aware and will use Vizualize.me. Until then though, there is a radical change in how professional information is displayed and gives it a playful yet intricate feel and depth. Users will certainly benefit from embedding and print functions but I am guessing that with time these will become available as well. It just makes me wonder though about how long will it take until Vizualize.me to move from a free model to a revenue based one – either freemium or change target group all together such as TokBox, JayCut and many other once free tools on the web have done. 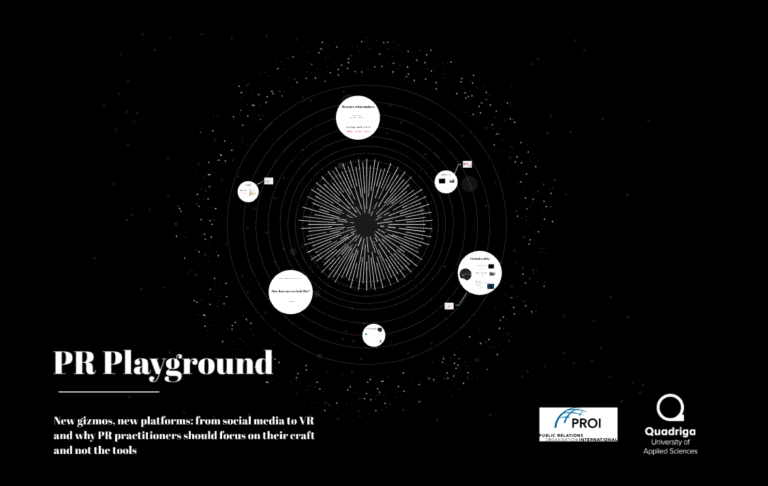 Behind the beauty of visualizing data of many kinds lie many questions related to how we currently engage with and relate to data, about how we project ourselves in an inter-connected world and how companies survive in this business environment. Plenty to ponder about. Until then…. Hi, I found your blog via the #phdchat hashtag on Twitter. The thing I don’t like at the moment is the skills section. It would work more effectively (in my opinion) if there were dialog boxes as with the other sections where you can expand and give evidence for the skills. Otherwise all you end up with is a list of buzz words (e.g. team working, management, communication, and so on). It’s easy to say you have these skills but I think employers would be more interested in how you’ve acquired and demonstrated them. I supopse you could argue that it would be your responsibility to make sure your skills are evident in the descriptions you add under your experiences, which would probably be my preference anyhow. I think I’d just worry that the simple (as in user-friendly) way that data is entered would encourage people (especially graduates) to think of a list of single words that they think should sound good to employers. It may draw people in with the lure of creating a CV that stands out but if it’s lacking in content you could just be left with some colourful shapes on a page. Chris, thank you for your message. I think you are right, there are things that Vizualize.me could do to improve the CV infographic outputs. And your are right, the last thing you’d want as an applicant and/or recruiter is to have some picked up from a pile of CVs based on looks but lack substance. However, as you say it yourself the responsibility of having a meaningful and representative CV lies with the CV owner. I believe Vizualize.me has quite a couple of things in store that they might not be quite ready to release. I am saying that because this looks like a very carefully planned release and because when you share your CV there is a promise of “unlocking” more features. I still find the venture interesting. Several years ago (or maybe months) it was only the design savvy that could create such CVs. Similarly, LinkedIn although popular among practitioners is little known among student populations. Bring them together presents a potential (as I said it in the post) for the beginners, the recent graduates. Now the tools of making people’s CVs stand out is free and easy to use. It would be great to see this as a turning point into us concentrating more on substance now that the uniqueness of design is almost guaranteed. Thanks for the idea, will try Vizualize.me. 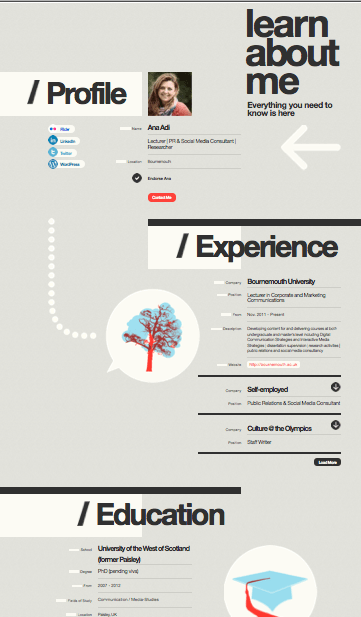 I’m also interested in the idea of visualising your CV in timeline format (http://timeline.verite.co/). Or maybe you could make an interactive data visualisation, where you could select what skills to see (http://www.tableausoftware.com/public). Just a thought. Definitely a very interesting area. Alina, these are very interesting but are applications that can only be reappropriated for cv visualization. I should add the timeline to my timeline tools post and the tableausoftware to alternatives to IBM’s Many Eyes, and data visualization posts. Nevertheless, they are a great addition to my digital playground.